It took around six hours to clean the river after the incident on Saturday morning. OVER 700 DEAD fish were found in a tributary of the River Lee on Saturday morning after a sewage spillage. Inland Fisheries Ireland received reports of discoloration in the water at Curraheen River on Friday evening. They found traces of discolouration and took water samples which were sent off for analysis. However, no dead fish were spotted on Friday night. Director of the South West River Basin District at Inland Fisheries Ireland Sean Long told RTÉ’s Morning Ireland that they have begun an investigation into the incident. Irish Water has confirmed that there was a failure at the Curraheen Road sewage pumping station on Friday. However, Inland Fisheries said it will carry out its own investigation which could lead to a prosecution. There have been a number of these types of incidents over the past four or five years on that stretch of water. Independent Cork city councillor Mick Finn said it was a distressing site for many young children. He told RTÉ’s Morning Ireland, “When I arrived, I went to the stretch of river in question and there were hundreds of little fish upturned in the river which obviously indicated that some sort of poisoning had taken place. There was a lot of kids around … and they were asking their parents why the fish weren’t moving and why they were turned upside down and obviously the parents had to explain to them that they were dead in the river. That’s not a pleasant thing for children to see or to hear. Long said it took around six hours to clean the river after the incident on Saturday morning. Inland Fisheries Ireland (IFI) asks the public to call its 24 hour confidential hotline number to report any suspected discharge into rivers across the country – 1890 34 74 24 or 1890 FISH 24. 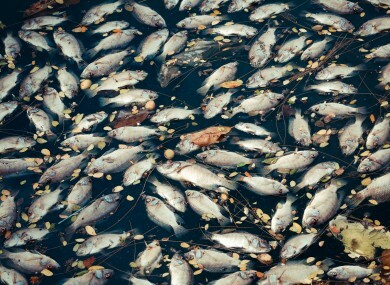 Email “Over 700 fish found dead in tributary of River Lee after sewage spillage ”. Feedback on “Over 700 fish found dead in tributary of River Lee after sewage spillage ”.